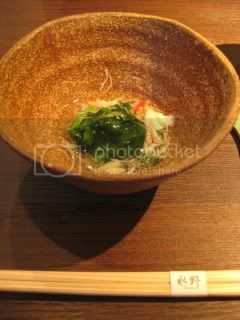 I had a wonderful lunch at a tiny Japanese restaurant, Mizuno, in Ginza the other day. 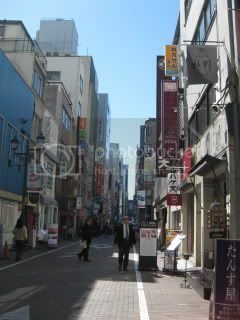 Just like many other restaurants in Ginza, Mizuno is located within a small business building on a small street. You walk up to the second floor to find a enterence. There are only 7 counter seats where you can see the action of the chefs, plus a few tables on the floor. I had one of today’s lunch set menus. Appetizer was spinach with crab+dashi sauce. I also had tamago-yaki (omelet). 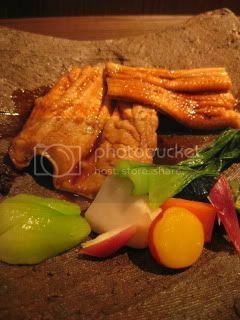 Main dish was Ni-anago (braised sea eel) with sancho berries and grilled vegetables. Superb! 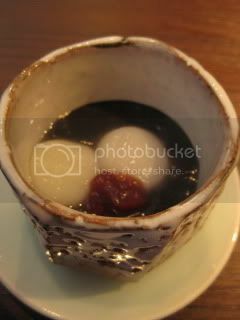 Dessert was black sesame zenzai (sweet soup). Everything was great at Mizuno. 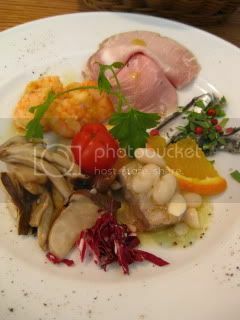 The next day was Italian lunch. My friend picked this spot, which is right near Shibuya Station. It was a Sardinian restaurant called, Tharros. My main course was a traditional pasta dish from the region. 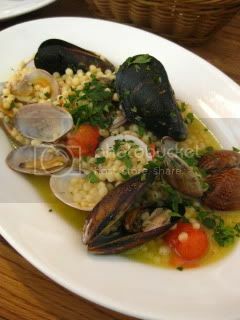 The pasta was like small grains (almost lie Israeli cous-cous), served in the light broth with different kinds of clams. I liked it!